Because sun protection isn't hard enough — what with all the reapplication and new regulations — we now must also consider the kind of sunscreen we wear. There are two main types of SPF: physical and chemical. "A physical sunscreen physically blocks rays by sitting on the surface of the skin," explains dermatologist Dr. Bruce Katz of the Juva Skin & Laser Center in NYC. "It usually contains zinc oxide or titanium dioxide. A chemical sunscreen absorbs into the skin and degrades the sunlight when it hits it. They typically contain ingredients like benzines, cinnamates, and avobenzone." 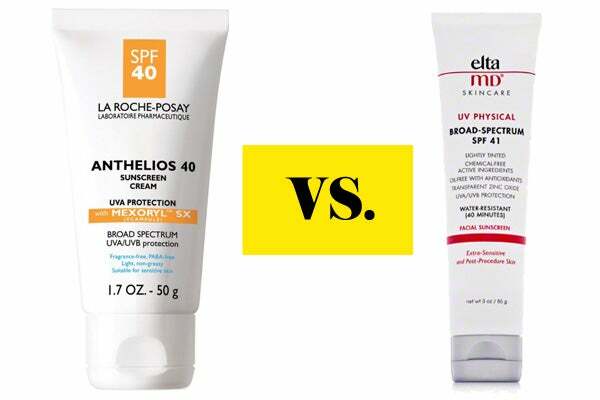 There are pros and cons to each sunscreen type, and picking the right one can come down to how the SPF interacts with your skin. According to Dr. Katz, chemical sunscreens are usually more popular, because they are easily applied and absorbed into the skin without leaving behind a greasy residue. They are "user-friendly," able to be applied in multiple ways like sprays, gels, or lotions. He also notes that chemical filters often offer more coverage against UVA and UVB rays than physical, but that range of protection will vary depending on the types of activities you are doing throughout the day (read: activities where you sweat or get wet). Some downsides of chemical SPFs are that they take at least 20 minutes to absorb into the skin and offer full protection; plus, they can be more irritating to those with sensitive skin. They also degrade and break down faster than physical sunscreens, meaning they won't last as long and you will need to reapply more often. Physical sunscreens, says Dr. Katz, actually reflect or block UV light from entering the skin, so they can prevent exposure to a broader spectrum of UV light. There's also very little risk of your skin reacting to the ingredients, unlike with a chemical filter. Those with acne or breakout-prone skin will benefit from a physical sunscreen, says Dr. Katz, as they are non-comedogenic, so they won't clog pores or aggravate acne. Traditionally, physical blockers have had a bit of a bad reputation for leaving behind chalky, white films, but Dr. Katz says that many companies have refined their sunblocks, so that they rub in well and do not leave behind any white traces. So, which one is the best? That all depends on you. If you don't like to feel any sort of residue and aren't going to be doing anything too physical while outside, a chemical SPF is your BFF. If you are planning on being outside for a long time, will be doing something that causes you to sweat or be in water, or have very sensitive or acneic skin that is prone to burning, then physical is probably where you want to be.